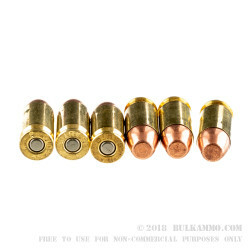 About as straightforward of a full metal jacket round as you can get in the .45 ACP. 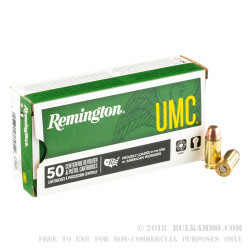 This hardball type ammo is made in the “MC” (Metal Case) 185 grain weight that Remington has been marketing for the past decade or so. It features a modified flat nose configuration hats till offers reliable feeding in even the pickiest of guns and the reduction in fouling and suitability for indoor range use is enhanced. The price is good, and the quality is consistent, which allows you to just relax and put some rounds down range. Remington has been famous for the reliability inherent in their processes and quality control protocols for more than 200 years. 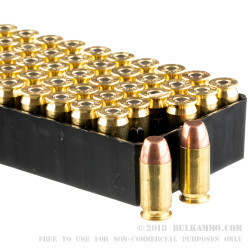 This is not some cheap, no-name ammunition. That said: this load is understated and fills a very specific use case – range work. The Reliability of the design pairs with above average ballistic numbers for a range line to give excellent reliability throughout the shooting process for a huge variety of firearms. More than 1000 feet per second of muzzle velocity and with 425 ft. lbs. 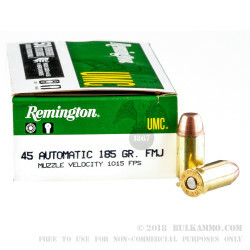 of energy, this is a great ammunition to use for diagnosing cyclic issues or for shooting without hiccups or distractions.